There were pockets of above average rainfall during September 2014, especially in western North Dakota, but a high percentage of the state recorded below normal precipitation during the month (see image below). 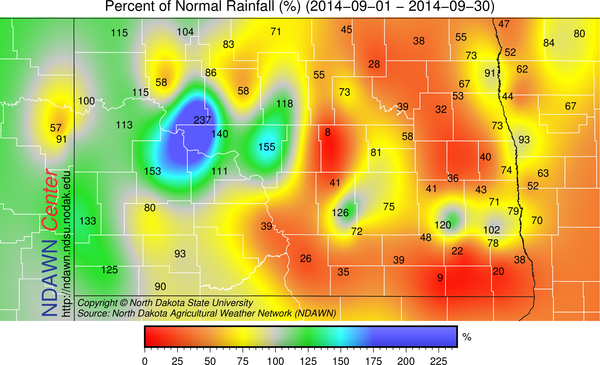 Using data from the North Dakota Agricultural Weather Network (NDAWN), the statewide average precipitation for September 2014 was 1.30 inches. That is below the 30 year average of 1.71 inches. That would rank September 2014 as the 52nd driest on record. Although September was dry across many parts of North Dakota, August 2014 was exceptionally wet, meaning that as of September 30, 2014, no part of North Dakota was listed with drought conditions by the U.S. Drought Monitor. 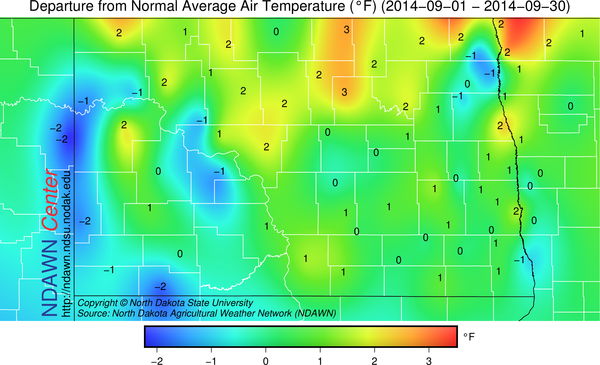 September 2013 was the last month with above average temperatures in North Dakota. The following 11 months all recorded a statewide monthly temperature that was below normal. That cold streatch ended last month with most NDAWN stations, with the exception of far western North Dakota, recording slightly above average temperatures (see image below). The overall NDAWN average temperature was 58.0 degrees which is 1.1 degrees above the average temperature of 56.9 degrees. That would place September 2014 as the 41st warmest September since such records began in 1895. 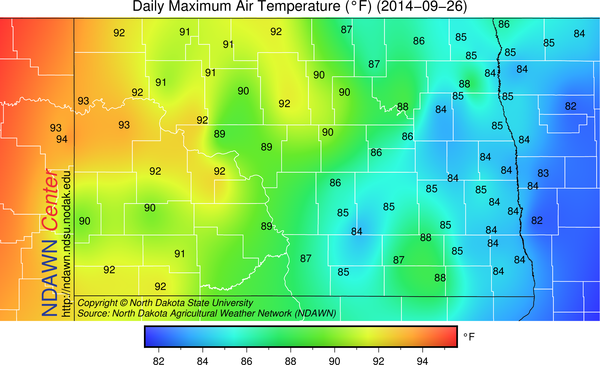 The warm season in North Dakota did not record many days with high temperatures in the 90s. The first week of September recorded highs in the 70s and 80s across the region, but on September 8, a cold front pushed through the state and the following week the temperatures were well below average. As an example, Williston recorded a high of 86 degrees on September 7, but on September 10 the high was only 46 degrees. The cold temperatures lead to an early season frost that either ended the growing season in some localized areas or did noticable crop damage that will impact yeild potential during harvest for many others. After that period of cold temperatures, a brief period of well above temperatures moved into the northern plains. These warmer temperatures ended up being close to the warmest recorded in 2014. 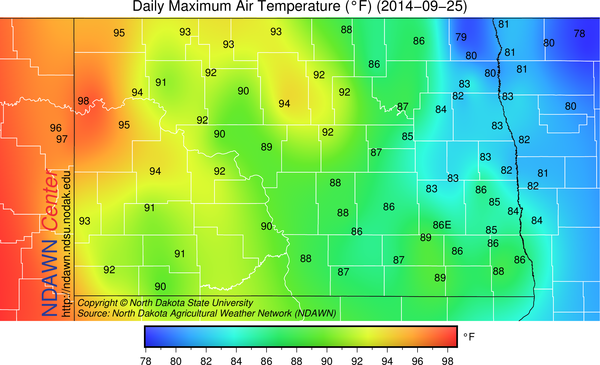 At least one NDAWN station recorded a high of 90 degrees or higher in a stretch from September 24-27. September 25 and 26 were the warmest of the days with fairly widespread high temperatures near or above 90 degrees (see images below). The warmest temperature during this stretch was a 98 degree high at the NDAWN station near Williston, North Dakota on September 25. That was the warmest temperature so late in the year at any NDAWN station such the network was started 25 years ago.